Providing you the best range of polyfix spray activator with effective & timely delivery. 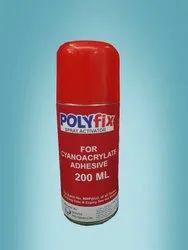 Polyfix spray activator is an aerosol activator which will give an instant cure if used with cyanoacrylate glue. This activator can be used before or after applying cyanoacrylate glue to surface which is to be bonded. It is commonly used with high viscosity or gel cyanoacrylates as the drying time for both of them are slow. The accelerator is solvent based and when applied dries immediately leaving a very thin layer of activator on the surface. Benefits- Fast curing of thick and high viscosity CA glues in less than 10 seconds while leaving no white marks after drying.